Yeah needs lots of work. Can you disable the head bobbing? Nope, 60 players isn't enough, especially with squads. This could be so much better with 100 players, the pacing is very slow. Gunplay, graphics are great, but the looting system is bad, ammo shouldn't take up space. What do you mean by head bobbing? That's rough mate, hopefully they give the option to turn off head bobbing in a future update. They should've at least put in solo with the low player count. The game has a lot of things going for it, they could be onto a winner if they listen to community and update regularly. From Respawn? Im in always! The gameplay of both titanfall's is top. I'm a big fan of Respawn too, want this game to succeed, they've some really innovative features like the ping system. Enjoyed it last night. Got my first win out of the way early. Its does a lot of stuff better than most BRs with only a few negatives imo. I think 60 is perfect. If you want to fight there are 5-6 hot spots with guaranteed action, if you want to take your time and loot there are places for that as well. -I love the stationed balloons(? )/ziplines around the map. Play like rifts on fortnite. Helps avoid all of the walking around. -Group jump is fantastic for building up the squad element. -Micro transactions are fair but time will tell on that one. -Class system makes it feel a bit more personalized to play style and lends to differing gameplay even if selection is limited currently. -Map is just the right size for the amount of players. -Ping system is absolutely fantastic. Getting much more cohesive play with randoms than any other game I have played because they have made it so easy to do. -Can be a little too much going on at times. When 3-4 mortar/artillery are being dropped in the same location it takes the fun out of it for me. Im sure I am still missing out on some things but after 4-5 hours these are the initial thoughts. Would be silly to not have it installed for a free game imo. Would be very surprised if this kills blackout as it doesn't look great and will most likely have alot of server issues. Trust me blackout is well and truly alive. Not sure about the beta but the game is great now. I can't stand the flashbang spam in Blackout, it ruins the mode. The game is more about equipment than gun skill. I was meh with Apex initially, but after putting a few more hours into the game, it has started to grow on me and the game has lots of innovative features. I played a few games with my nephew last night, it was a lot of fun. The game needs a solo mode though, because matching with randoms doesn't work nine times out of ten. Randoms never drop in the area with the blue marker that has the best tier gear, once you get the jump master, they usually die immediately and won't wait for a revive at a spawn beacon. I'm going to try Apex on PS4, it's very sweaty on Xbox. Level 16 now, got 5 wins and most kills in 1 game was 10, but I’m averaging at around 5 kills per game I guess. If anyone who’s half decent wants to team up let me know! I read somewhere u could select your own server, u cant on xbox can you? Not that im having any problems but would like to see what my latency was as its another EA game. Yeah you can, just leave it on the main menu until it disconnects you from the server. Then press R3 to select the server. I'm playing on the London server with a low ping and the connection is brilliant. There is a bit of a learning curve at the start, took me a few hours to get the suss, but once you get used to everything, game is a blast. 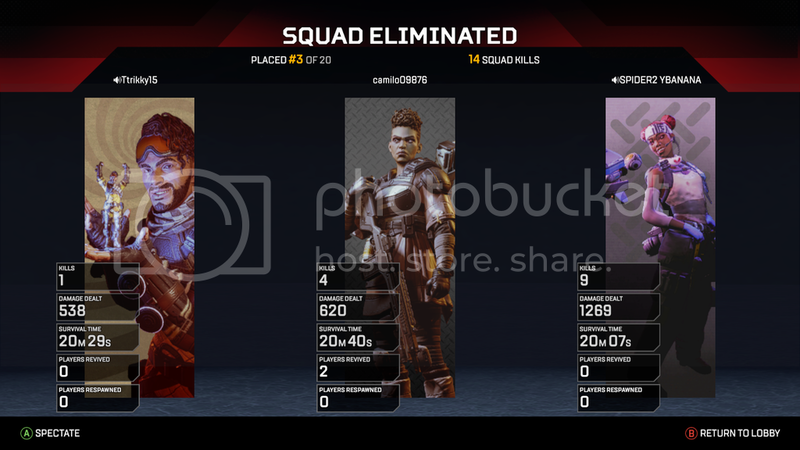 The economy is really fair in the game too, Apex is quickly becoming my favourite Battleroyle. Yeah got it working London ping 22, Amsterdam 28, Belgium 28, Frankfurt 34. Yeah mate, it's great that you can select your own server with the lowest ping. Lifeline is the most important character, if you want wins, your team should always prioritise her. Best game so far. Didnt win but had more fun in this one than in the games that I have. Nice, had a ten game win last night with 1137 damage. Ich spreche eine bische deutsch jah. I speak a bit german, okay. Liking this a lot at the moment, love that they transferred the Titanfall-esque movement across. Anyone on here playing on PS4?